The leaves are changing colour and there is a bit of a chill in the air. That’s right folks, one of the coziest times of the year is upon us. Not only does this mean cozy sweaters, comfort food and sweet pumpkin treats, but it also means a large variety of things to do with your family. Fall is here and there is no better time for you to discover fun things to do with your family this fall. The best pumpkin farms have so many different pumpkins for you to choose from. Not only that but they usually offer a wide variety of fall activities like corn mazes, hay rides, seasonal markets and more. Bring some good pie pumpkins home with you and make something yummy like my most requested recipe for Easy Pumpkin Swirl Loaf (it’s stuffed with cream cheese filling!). Apple picking is a fantastic fall activity for families. Not only is the perfect time to visit a local orchard but it’s also the perfect time for some delicious apple desserts. Here are over 50 ways to use apples this fall. There is nothing quite as warming as a beautiful bonfire on a chilly day. Roast hot dogs, make s’mores and snuggle under a blanket around a cozy fire. Check your local bylaws to make sure you’re allowed to have one in your city! Have a movie marathon of classic autumn movies. You can find some suggestions of great fall movies here. Or choose your favorite scary/scary-ish movies and get a jump on Halloween. I could watch Hocus Pocus over and over again! Popcorn, mugs of warm fall drinks, and cozy blankets are bonuses. Or at least mostly from scratch. You can use a store-bought crust if you want. I won’t tell. Making pie is one of my earliest memories. I’d be in the kitchen with my mom or one of my grandmothers, helping. They’d save the scraps of dough so that I could roll it out into one tiny perfect little tart. We’d fill it with grape jelly and bake it to perfection – well, perfection for a 4 year old anyway! The smell of pie baking takes me right back to my childhood and to my family every single time now. This maple cheddar apple pie is one of our favourites. There isn’t much that says: “Welcome fall” as a beautifully carved pumpkin perched on your front porch. This makes for a wonderful fall family activity. Creating fall crafts is a fantastic way to have some family fun this autumn. In fact, you can even make a simple DIY Thanksgiving centerpiece together. There is nothing quite like delicious comfort food to warm your family up over the chilly fall months. Why not get in the kitchen together as a family and create something yummy? A delicious slow cooker vegetable soup is a fantastic, comforting soup to enjoy. Or how about a southern comfort food classic – chicken soup with dumplings? Many communities offer fantastic fall festivals for families for everyone to enjoy. Check your local listings to find one near you. The fall is the perfect time to toast some delicious pumpkin seeds. In fact, you can even try some different pumpkin seed flavourings and have a taste testing adventure. There is no better time to get started on your Halloween costumes. In fact, you can even make your own no-sew Halloween costumes for the entire family. Add some hygge to your home. Autumn is a natural time for it. Bring on the coziness! Would you believe this is something I have always wanted to do and never have? It just has never worked out! Even if you aren’t much of a football fan, I think tailgating and attending just one football game in the fall is just such an iconic thing to do! PS – I am a college football fan. Woooooo pig sooie! Go hogs! Take a fall drive in the country. I’ve done this nearly every year of my life and the magic of the leaves changing color never grows old for me. Want to make a full day of it? Pack a picnic lunch and search for the perfect spot to dig in! You might want to plan a hike while you’re out there. The crunch of those fallen leaves under your feet holds its own special appeal. I keep one on a regular basis but if you’re not up for that, doing one during this season of Thanksgiving is a perfect compromise. Post it daily on social media or keep a good old-fashioned hand-written one. Take a blanket with you to sit on. Trust me on this. The hay can feel kind of itchy and stabby otherwise. Besides, it adds to the fall atmosphere if you take along a pretty plaid blanket! Warm it up or drink it cold. Either way, it’s like autumn in a mug. Go get lost in a corn maze. Many of them are really interesting and really elaborate. There are often other fun things there in conjunction with it so you may be able to make a full day of it if you want. See if you can see any birds – and other animals for that matter – getting ready for winter. Watch for and point out to your kids that fascinating V pattern that geese and other migratory birds make as they fly south for the winter. Collect some pretty leaves and make art with them. You can preserve them with wax, press them between paper and heavy books, or even make rubbings of them. Hang some up in your window like the autumn version of sun catchers! The kids will have a great time figuring out how to dress her/him! Just be sure to give them a pile to choose from or they may be picking your favorite cocktail dress from your closet! Go on a fall scavenger hunt. Make a list (or use picture cues for the little ones) of items to look for and send everyone off in pairs to find them. Or search for them as a family. Give yourselves a reward for your efforts. Take your family out for an autumn photo shoot. Find some great fall backdrops and take some family photos. A pumpkin patch, trees with colored leaves, or piles of leaves in your backyard all work really well. 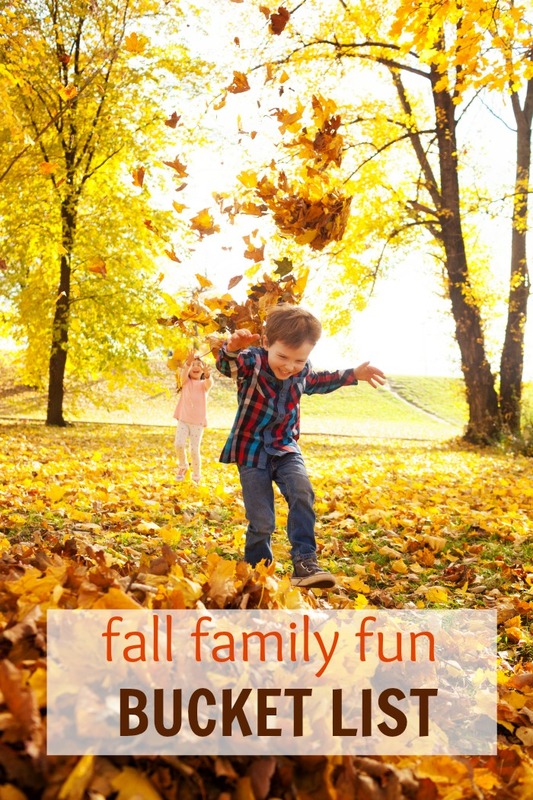 There are lots of fun things to do with your family this fall. Just make sure to get creative and get out there to enjoy the weather and each other!